Digital marketing is not just the digital version of print media, TV and radio. The difference is that digital marketing lets you target your advertising with incredible specificity and then measure the impact of that advertising in realtime. Put another way, digital marketing is about using internet-based mediums to get access to your ideal audience without wasting money on people that are unlikely to want your product. For example: A TV ad about sports bras is probably only going to appeal to the female half of viewers. The same ad on Facebook could be targeted at women between the ages of X and Y that live in Melbourne, Australia and are interested in running. This is a screenshot from Facebook’s Ad Manager. These are only a handful of the targeting options, but you get the point. 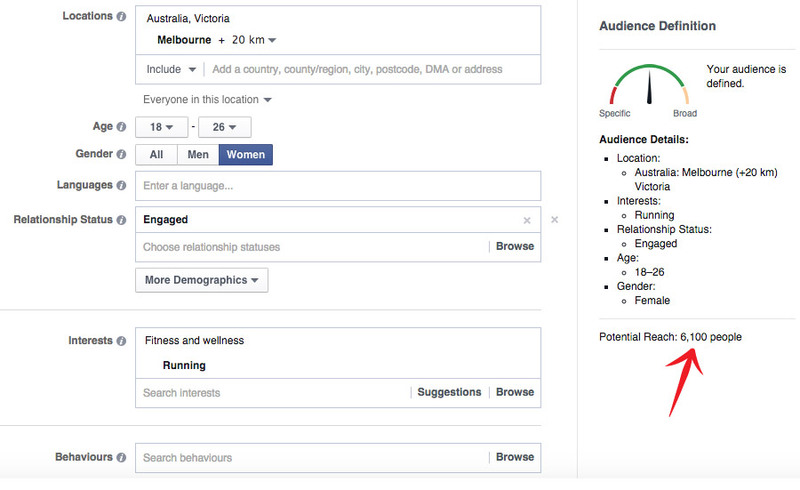 In this example, you can see that there are 6,100 women between 18 and 26 who are engaged to be married, live within 20km of Melbourne CBD and love running. Now imagine you’re a personal trainer, you could spend $50 running a “6 Week Wedding Bootcamp Special” advert to those 6,100 people. We know from experience that you’d fill up multiple sessions within days and given that new people are getting engaged all the time, you could literally base your entire business on the Wedding Bootcamp niche. Facebook advertising is THAT powerful, provided you know how to use it. Search Engine Optimisation (SEO): Which involves building high quality content on your site, and high quality links pointing to it, to make your site show up first in search results. Search Engine Marketing (SEM): You may have heard of Google AdWords or BingAds, these are just 2 of many search engine marketing platforms that let you place your site next to the top ranked search results for your chosen search phrases. Display Advertising Networks: You might know of these as banner ads on your favourite news website or app. The owner of that website or app gave a Display Advertising Network space to display ads. Advertisers bid to have their ads shown to visitors to those sites and apps. Social Media Marketing: Sites like Facebook and LinkedIn have their own advertising networks that you can leverage to get your product or service in front of people. These are particularly powerful because they know so much about their users. Think about everything Facebook knows about you: gender, age, home, current location, profession, marital status, sites and products you’ve ‘liked’ in the past, interests, etc. Not to mention everything about your friends and changes in their lives: Think wedding gift advertising when a close friend changes their status to ‘engaged’. Influencer Marketing: For example, reaching out to an influencer with 10,000 Instagram followers to post about your product or service. Internet Radio: Services like Spotify, Tidal and Pandora let you listen to music for free, in return for playing you an ad every few songs. Click through rates are typically lower on internet radio, due to most people listening while they’re on the go. But, if you can construct a compelling audio advert that will trigger action in listeners, you have a massive opportunity to get cheap leads with internet radio – at the moment, at least. OK, so we’ve shown you that you can start getting laser-targeted leads to your website or business using digital marketing, but that’s really only the beginning. You can further improve the effectiveness of your ads by tracking which ads (and targeting) lead to conversions (product purchases, sign ups, phone calls, app downloads). The example we gave above assumed that women who like running would be interested in bootcamps. In reality, this might not be the case. Gone are the days when you’d rely on an advertising agency to use “informed guesswork” to determine who wants to buy your product/service. Now we use conversion data to eliminate the guesswork and make these decisions for us. You add conversion tracking to your website. Creating conversion triggers that notify Facebook when your visitor completes checkout, submits a quote request, taps your phone number or navigates to a certain page. You’d then run $10 spread evenly across those 6 ads, each day for a week. You’d analyse the conversion data at the end of the week and identify which targeting characteristics were most effective. You keep the most profitable and then use them as the basis for creating another set of ads. You might find that “Gym” works best on the 20-24 year olds. So you’d keep those running and create 4 more ads that tweak those characteristics slightly. Once you’ve used the data to find the most lucrative targeting options for your audience, start trialling different ad images, titles and copy. Again, create a few, see which ones convert the best and then create variations of the successful ones to further refine your digital marketing campaign. We’re hoping you’re now aware of just how powerful digital marketing can be. We’ve also given you an outline of how to build a successful campaign. Many of our clients get us to handle their digital marketing because we have the tools an experience to speed up the process, better analyse the conversion data and allow our clients to focus on their business. If you’re ready to stop worrying about where your leads are coming from, and start focusing on your business, give us a call (0409 911 922) or use our contact form to find our how we can take your business to new heights.